Welcome To The Boom, Oklahoma City's premiere LGBT inclusive dinner theatre and nightclub. We are open Tuesday through Saturday from 4pm until 2am, and Sunday from 11am to 2am. 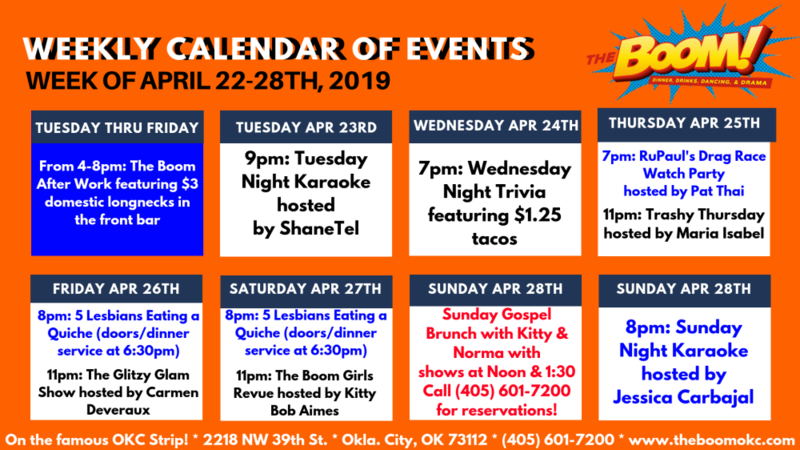 With dinner theatre, female illusion shows, Sunday Gospel Brunch, monthly drag bingo, a weekly Trivia Night and karaoke plus a full service kitchen we've got something for everyone! 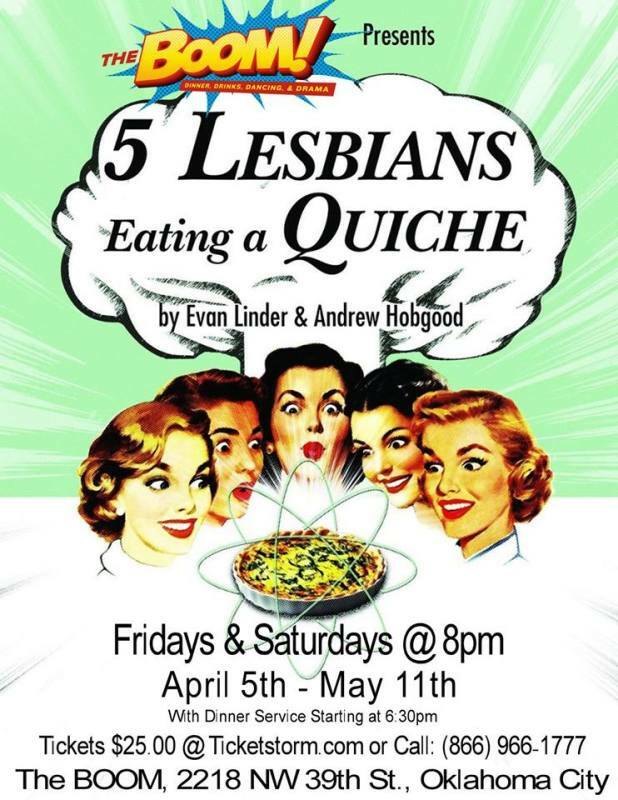 “5 Lesbians Eating A Quiche” by Evan Linder and Andrew Hobgood is a yummy piece of theatre playing at The Boom this spring. No Men. No Meat. All Manners! It's 1956 and the women of The Susan B. Anthony Society for the Sisters of Gertrude Stein are having their Annual Quiche Breakfast. Will they be able to keep their cool when communists threaten their idyllic town, turning their community center into a bomb shelter? This silly, sapphic story of pastry and forbidden love will leave you in stitches! The show runs April 5th through May 11th every Friday and Saturday at 8pm, with our theatre showroom opening and dinner service starting at 6:30pm. The Boom is located at 2218 NW 39th Street, in Oklahoma City, and all patrons must be 21 or older to enter, with proper ID. TRASHY THURSDAYS AT THE BOOM! Every Thursday is Trashy Thursday at The Boom, OKC's original and best Thursday night party featuring up and coming drag performers and hosted by Shantel P. Mandalay and Maria Isabel!